To enhance capabilities of digital financial transactions, KBank has worked with Big C Supercenter through the launch of the new service for accepting QR payment and cash deposit at any cashier counter of more than 1,200 Big C outlets across the country. Mr.Patchara Samalapa, KBank President, said that “KBank, as a strategic partner, which has expertise in financial solutions and digital banking will help facilitate Big C customers in conducting various financial transactions at a single place with ease and security. Every Big C cashier counter of any format throughout the country will act as a K PLUS SHOP outlet to accept QR payment via K PLUS and other mobile banking applications and e-wallet payment by Chinese clients, especially travelers who use Alipay and WeChat Pay applications. KBank has also appointed Big C as its banking agent to offer “KBank Service”, starting from cash deposit-taking to a KBank account on a real-time basis. KBank is confident of Big C employees’ readiness in providing services to allow customers to perform financial transactions at any Big C cashier counter even during non-banking hours. During the initial phase of Big C-KBank cooperation, the following three services will be offered to the customers. (1) QR Code payment service via mobile banking application of any bank: Customers making QR Code payments at Big C from April 1 to May 31, 2019 will get an array of special promotions. Those making payments via K PLUS are eligible for double promotions, i.e. 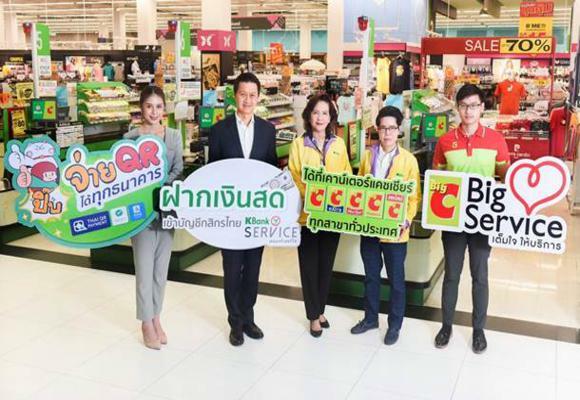 a 20-Bath cash back when spending at least 200 Baht and Big Card members spending from 300 Baht and higher at Big C and PURE Pharmacy on the weekend will get 300 reward points or those spending at least 120 Baht at Mini Big C will receive 120 reward points. (2) Tourist Payment Service for Chinese customers For payment via Alipay and WeChat Pay, customers can join the marketing promotion which will be offered during the Chinese Golden Week. Moreover, customers can make a payment without having to converting currencies. Special for Alipay customers, they are entitled to an e-coupon worth 150 Baht free-of-charge for every purchase of 1,500 Baht or more at every participating outlet of Big C Supercenter from today until June 28, 2019. (3) Deposit Service Customers can deposit cash up to 40,000 Baht/day/ID number to KBank account. The service is now available at 14 Big C branches and will expand to over 6,000 cashier counters at all Big C and Mini Big C branches by April 2019. The account opening and withdrawal service is scheduled to be operational by the end of this year. Special for Big Card holders who deposit cash to KBank account, they will earn 500 Big Card points instantly from today until July 31, 2019. More information can be obtained from BIG C BIG Service staffers at any branch nationwide, www.bigc.co.th, Facebook: Big C – บิ๊กซี, tel. 1756, the K-Contact Center tel. 02-8888888 or www.kasikornbank.com.